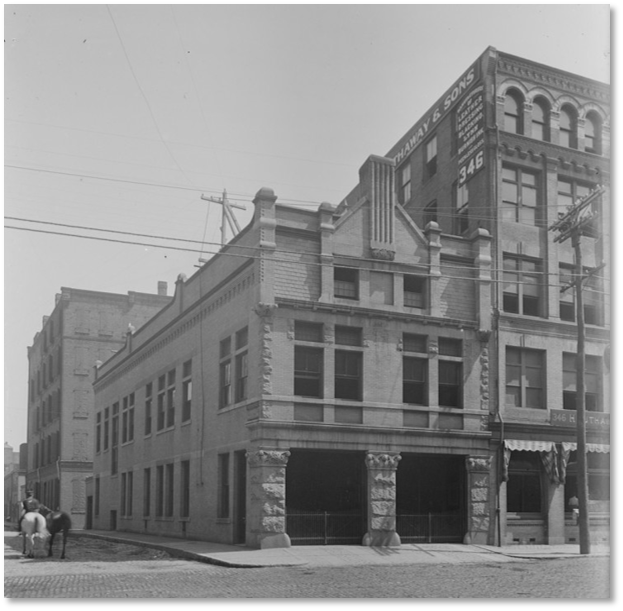 On Congress Street, set amid the Boston Wharf Company’s uniform warehouse buildings and not far from the Seaport’s homogeneous glass boxes you will find a small, ornate structure that looks completely different. 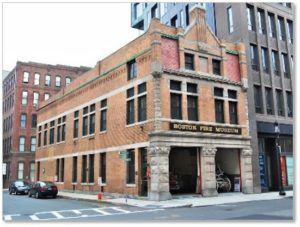 The former Congress Street Fire Station, now the Boston Fire Museum, looks nothing like the rest of the neighborhood. That’s because it was one of the few buildings in the Fort Point Channel area that was not designed by the Boston Wharf Company’s staff architects. It’s also shorter than the surrounding structures, just three stories instead of five or six. Although the BWC originally owned the land, they sold it to the city to gain protection for the company’s wool warehouses. The fire station housed Engine Companies #38 and #39, which were originally horse-drawn engines, and later became Engine #9 and Ladder 18. City Architect Harrison Henry Atwood designed the Congress Street Fire Station in the Romanesque Revival style with light-colored brick, red tile, and rusticated granite at the ground level. The detailing becomes more refined on the upper two floors. Walking into the station, you may notice the absence of columns or poles on the main fire apparatus floor. Mr. Atwood opened up the first floor by using an ingenious method. A wooden truss-type roof holds up the second floor with a series of steel columns that extend downward. The six stalls that originally housed the horses that pulled the 19th-century fire apparatus left the firehouse in 1917, after which the city renovated the building. I wonder if the horses went to the city stable on Commercial Street. The Romanesque Revival, or Richardsonian Romanesque style, was created by Henry Hobson Richardson in the nineteenth century. The fire station’s polychromatic façade with contrasting stone, red tile and brick, along with its thick entryway and window openings are typical of this style. The fire station gives us an example of Romanesque Revival writ small and compact when most such buildings were large in size and massive in weight. In addition to the Congress Street Fire Station, Mr. Atwood designed the Bowditch School (1892) in Jamaica Plain, the ivy-covered Harvard Avenue Fire Station (1891), and several churches in the Roman Catholic Archdiocese of Boston. He also completed unfinished buildings from former administrations, including the Horace Mann School for the Deaf (1892) in Allston, and the South Boston grammar school and designed projects for other Boston municipal departments. Prior to being named City Architect at the age of 26, Mr. Atwood lived in the home at 61 Alban Street in Dorchester, that he built in 1888. It was listed in 2016 for $1.1 million. 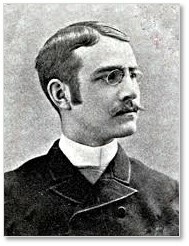 A lawyer as well as an architect, Mr. Atwood also served multiple terms as a member of the Massachusetts House of Representatives. In 1895, he was elected for a single term in the 54th Congress of the United States. Mr. Atwood retired from his architectural profession in 1938 and moved to Wellesley Hills. He died in 1954 and is buried in Jamaica Plain’s Forest Hills Cemetery. The Congress Street Fire Station operated until 1977. Its firefighters typically worked for nine days straight with one day off to recover, clean up and eat. The Congress Street Fire Station was added to the National Register of Historic Places in 1987 and was included in the Fort Point Channel Historic District in 2004. The Boston Sparks Association opened the museum building in 1983 and dedicated it as the Arthur Fiedler Fire Museum. It houses the famous conductor’s extensive collection of fire alarms, antique fire apparatus, firefighting equipment and antique photographs. The architect who designed the Congress Street Fire Station was himself a member of the United States Congress. I love this synchronicity. Like the two Boston streets with a connection to George Washington and Louis Prang’s double link to Christmas, they bring added interest to Boston’s history. 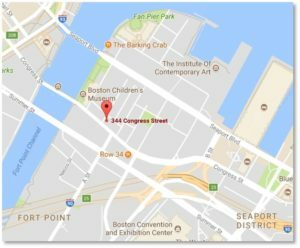 The Fort Point Channel historic neighborhood and the Seaport District with its Harborwalk are both fascinating areas to explore on foot. Ditch the car in one of the surface parking lots, lace up your walking shoes and explore. If you have kids, combine visits to the nearby Children’s Museum and the Fire Museum for an exciting day. Do it fast, though because these two Boston areas are changing as we speak. With GE putting its new headquarters on the Fort Point Channel and the Emerald City of glass boxes sprouting up in the Seaport, you can be sure it will look different every time you visit. I don’t expect the Boston Fire Museum to change, though. It’s chock full of exhibits, equipment the kids can climb on, and volunteer firemen who are eager to explain everything. You may even meet Sparkles the Fire Safety Dog. This entry was posted in Boston, History and tagged Boston Fire Museum, Boston Sparks Association, Boston Wharf Company, Congress Street Fire Station, Fort Point Channel, Harrison Henry Atwood, Romanesque revival, Seaport District by Aline Kaplan. Bookmark the permalink. Greetings from California! I’m bored to tears at work so I decided to checkout your website on my iphone during lunch break. I love the info you present here andcan’t wait to take a look when I get home. I’m surprised at how quick your blog loaded on my cell phone ..I’m not even using WIFI, just 3G .. Anyways, superb site!